Provides backup power to help make sure that your network can stay connected during a power outage. 2 surge-protected outlets and 3 USB ports let you connect a wide range of devices. Smart Charging technology helps to maximize charging speeds according to the type of device detected. Battery pack can also be removed to serve as a mobile power pack. 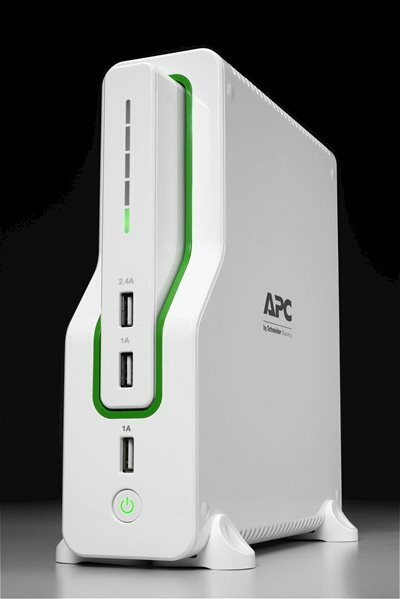 The APC Back-UPS Connect BGE50ML is the industry's first combination UPS and Lithium-Ion mobile power pack. Designed to power wireless networks for hours during storms and blackouts, the BGE50ML's battery (M12USWH) is also a mobile power pack which can be removed to charge tablets and smartphones on the go. The Mobile Power Pack provides approximately 5 full charges to a smart phone without needing to be recharged, an excellent solution for heavy mobile users. When the mobile power pack is docked, the UPS (50 watts capacity) provides 2.5 hours of backup power to a home or small business network. Connect to the internet during outages and power your mobile devices on the go with the Back-UPS Connect BGE50ML. Power outages can happen quite often, ranging from brief interruptions to long-lasting storms. When the power is out, your network cannot connect to the internet. This makes it difficult to get in touch with the outside world for personal or work communication. The BGE50ML features a lithium-ion battery pack that provides hours of critical power to your network during outages. This backup power source ensures you can get weather updates, make phone/video calls, check e-mail, stream movies, continue gaming, maintain home automation/wireless security connectivity, and more. The BGE50ML features a removable Mobile Power Pack (M12USWH) for charging your mobile devices on the go. This compact, portable battery charges a smartphone five times from 0 to 100 percent before it needs to be recharged itself. Convenient LEDs on the front of the battery let you know how much power remains in the power pack and alert you when power is low. The M12USWH is also sold separately to support the user who needs extra UPS and mobile power. An additional Mobile Power Pack doubles your runtime during an extended outage, or provides an extra battery for the UPS at home when you're on the go. The BGE50ML features two outlets that can be rotated 90 degrees and 45 degrees to fit nicely within any home setup. Charge your mobile devices using the three USB ports, including a 2.4 amp USB port that integrates Smart Charging technology to maximize output according to the type of smartphone or tablet detected. When the UPS is connected to AC power, you can charge the power pack and your connected USB devices simultaneously. The BGE50ML provides surge protection for your network and mobile devices. Connected electronics will be safeguarded against lightning, surges, and spikes, even when the battery pack is removed. APC BGE50ML Back-UPS Connect with mobile power pack (M12USWH), power cord, USB cable, and user manual.